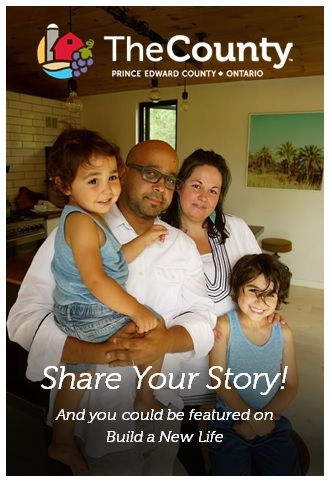 “We just needed the house to be livable,” says Steve of their house hunt six years ago. 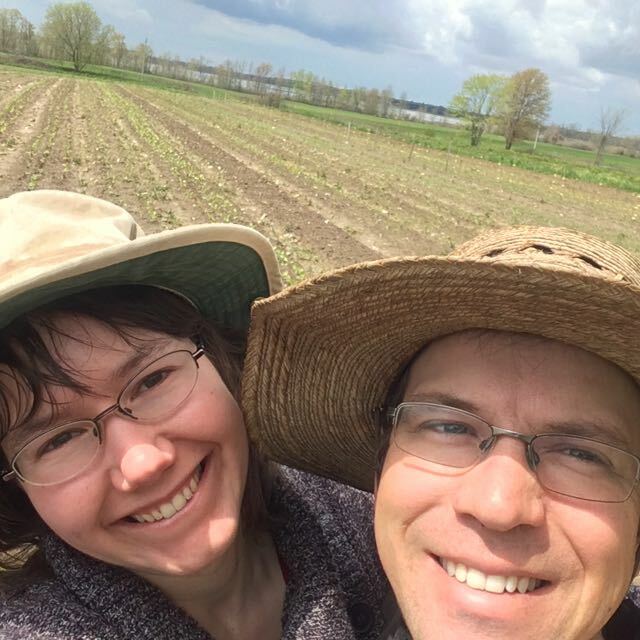 “We were looking at soil maps and choosing properties to view based on them, independent of the house.” They wanted to plant a garden right away if they were going to hit the ground running. They needed a house to be functional but, with no funds for big renovations, almost everything in their price range was a disaster. “Then we found this one,” he says happily. “It had perfect land and a ridiculously enormous house. It was livable, but needed work. It’s an old house.” He’s not kidding. It was built in 1845 and Heather and Steve love its 10 foot ceilings. But they love the soil even more. 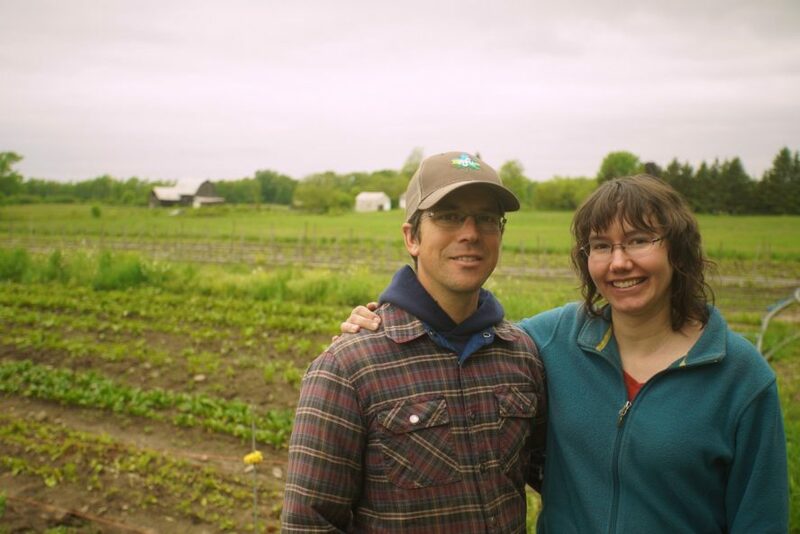 Steve bought the property with his father, who became his business partner when Steve decided to start Fiddlehead Farm. It’s what made it possible, but that massive eight-bedroom house has paid its way, too. We’ll let Steve and Heather tell their tale. “We rent one side of the house through Air B&B, and we rent rooms in our side to employees. 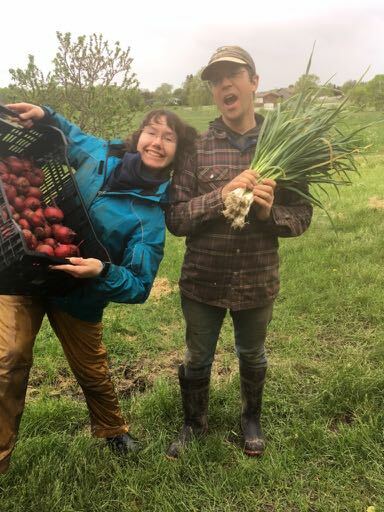 It’s hard to find affordable housing, so it works for them and for us.” Fiddlehead Farm has three full time seasonal staff and have also started offering some winter employment. “The Air B&B is usually full July to September with occasional winter bookings which helps pay the mortgage. But our favourite part is showing people how the farm works. Part of the pitch is inviting people to get down on the farm and see where their food comes from. If people want a full tour, we’ll walk them all around, but often they’re happy just to buy from our farmstand. Families take a walk with the kids and if I’m in the carrot patch I’ll pull one for them so the children can see how real food works. Fish Lake Road was pretty sleepy when we moved in, but since Three Dog Winery opened we get a lot more people dropping by. Pyramid Ferments is close by. D’Ari and Mel (who are Villas) live down the street. There’s an antique store opening up, I hear, and Harper Run Stables has been here a while. There’s Foster’s fishing camp not far away. It’s still a relatively undiscovered area of The County which made it affordable for us. Being close to the highway turned out to be great because selling at Toronto markets is a larger part of our business than we anticipated. 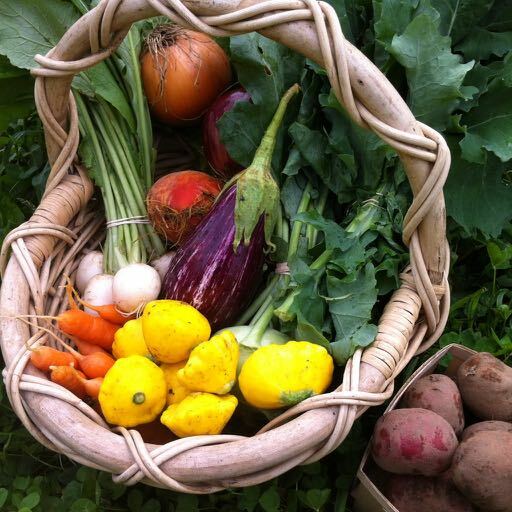 We grow more than 40 varieties of vegetables, everything you need for a really good meal. Early summer it’s a lot of greens, lettuce, of course, spinach, chard, kale. Edamame beans are one of our unique crops, and we have heirloom tomatoes, peppers, eggplants, squash, zuchini. 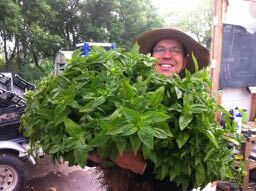 We sell mostly through farmers markets, five in Toronto and one Belleville. 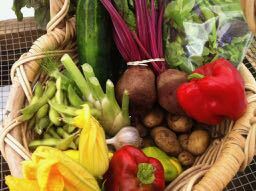 We also do a CSA program, Community Supported Agriculture, supplying weekly or bi-weekly boxes of vegetables that customers can pick up here at our farmstand or in Picton, Bloomfield and Belleville, and we have CSA customers in Toronto, too. We’re crazy busy in summer. It’s slower in winter, but we still have to eat and pay bills, so we thought, what can we do? Well, many vegetables store very well. We learned about that from Tim and Vicki and we fitted an old shipping container with insulation, air conditioning in summer and a space heater in winter, and now we store fresh vegetables year round. We can sell good sweet carrots all through winter and spring until the new crops come in, and that allowed us to keep our year round spot at Wychwood Barns farmers’ market in Toronto. We do winter CSA boxes, too. Do we sell to local restaurants? Not a lot. We don’t have the volume to offer bulk prices. But we supply to the distributor 100 Kilometre Foods in Toronto and sell direct to a couple of little restaurants who pick up from us at farmers markets. It’s good to load up the van with 2,000 pounds of carrots and rutabaga, drive to the city, drop them off at one place and come home with the month’s bills paid. We like that! It’s hard to supply small orders at discount prices. The price we get at a farmers market is very different to what we could get wholesale. 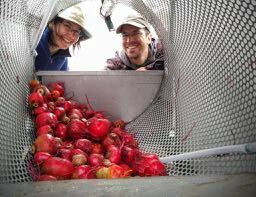 Recently, a local business wanted to pickle our beets, so we pitched a price about 50% lower than we’d get at market. But she said she could buy organic Ontario beets from a big food distributor for half that again. We can’t compete, because we tend our stuff by hand. We got some efficiency upgrades last year, with help from PELA, new tools and transplanting equipment that made an amazing difference in speeding up day to day tasks and labour. But part of our goal is to create decent paying work for people. A lot of small farms rely on interns or volunteer labour, but we want to offer paid work, ideally fulltime, to employ people 12 months, not just seasonally. We’ve succeeded so far in offering at least minimum wage or better. The next goal is expand to longer term employment. Our work crew starts May 1 and usually works through to November. 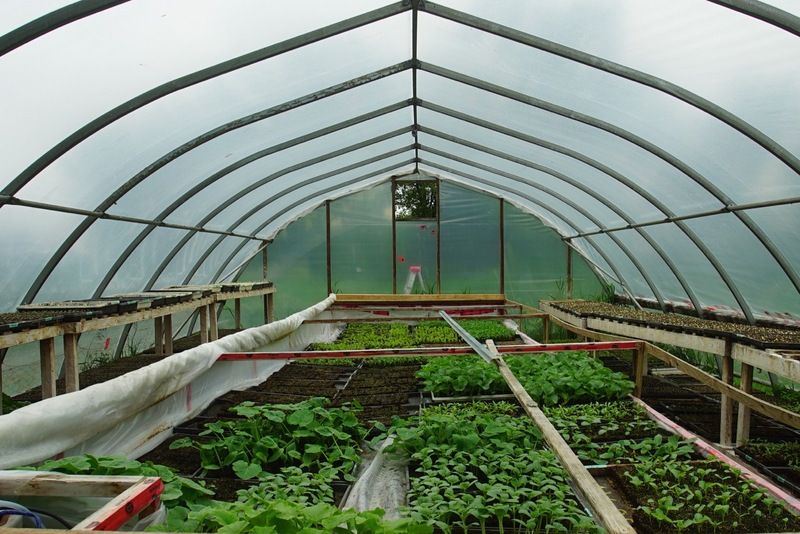 We want to look at greenhouses, pushing winter production so we can produce food year round. We’d like to even out the work if we can. Okay, farming is seasonal, crazy in summer, slower in winter, but if we can make little changes, manage the work better, have maybe a little rest in summer and more workflow in winter, we’d like that! Steve volunteers with the National Farmers Union of Ontario. “I’m on the local board,” he says. (Heather interrupts saying “He’s president!” Steve ignores her. “I’ve been on the local for years, and as of March 2017 I’m on the provincial board too. NFU focuses on small and medium scale farms, advocating for policies to help them thrive. Any farm business pays fees to the government, but you can choose if it goes to the Ontario Federation of Agriculture, OFA, or the Christian Farmers Federation, CFO, or the National Farmers Union. Ecologically minded farmers lean toward the NFU. The OFA is heavily invested in, and represents, the big industrial form of agriculture, large cash crops. They already have a lot of money supporting them, and small farms like us can get lost in their dialogues. We have different needs. The small, mixed equipment we need is hard to find. We need stuff to work with multiple crops in tight spacing and you don’t find that at the big standard farm shows. In fact very few places even build the equipment we are interested in. Our labour needs are different, too. 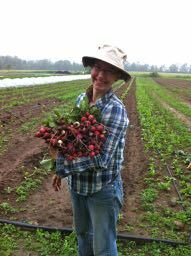 We harvest constantly from early summer to December. 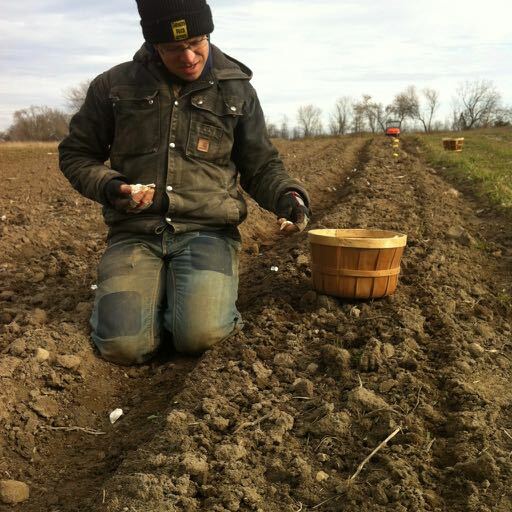 It’s not easy to find employees who are actually driven by farming. A lot of people are interested but they don’t really enjoy the actual work. To really thrive at it you have to be passionate about growing food for a local community but also love the hard, sometimes monotonous work. 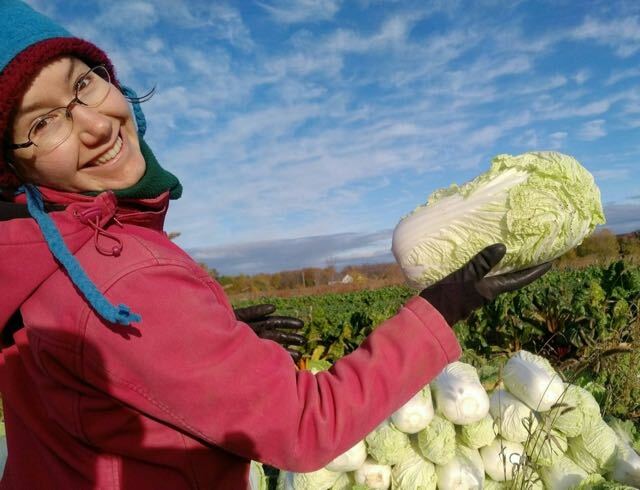 There is a larger movement of small organic farmers across Canada, and some of our regular staff come from Prince Edward Island or B.C. They travel to see the small organic farming movement, particularly vegetables, in different places. The more you learn before you start your own place, the better you will do. We worked for other people in the Ottawa area, and it was very different from The County. 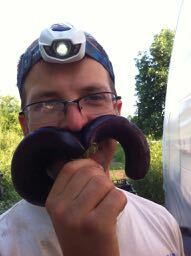 We knew Kingston area small farmers got together regularly to help each other out, get to know each other, have fun. It was a big part of what drove us to move to this area. 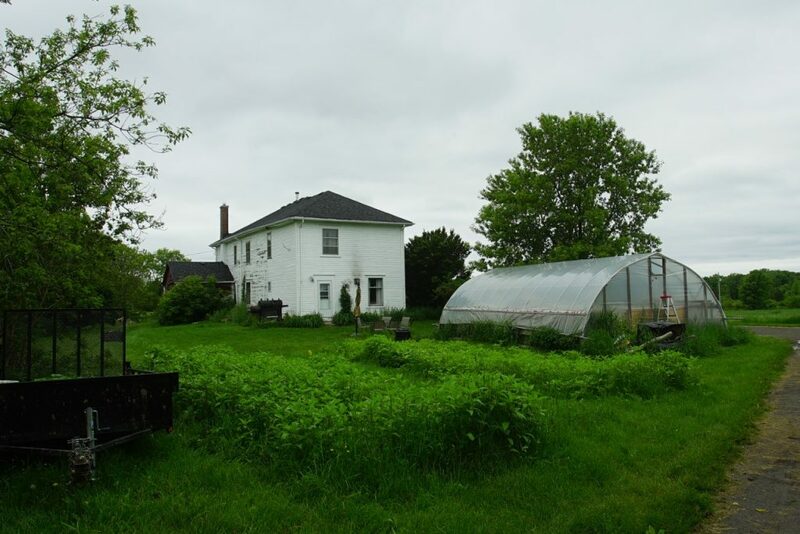 Loyalist College is interested in tailoring programs to provide labour for small County farms. 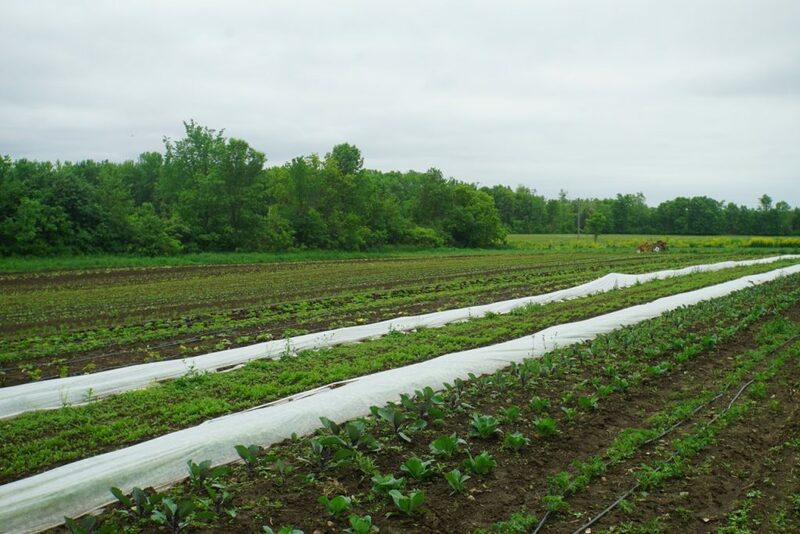 Big farms that grow cash crops are using less people as they get more automated, but small farms are growing in Prince Edward County. It takes training to learn the physical work. It can take weeks to get a feel for the motion, the equipment, the exertion. The best workers for us are those who have worked a year already on a farm, even if they have a break in between, because they are used to working physically. You develop the rhythm, the hand-eye coordination, the coping techniques. I’m not sure you can teach that at school, but college programs can give people the confidence to consider starting a farm. I did a year long course at Fleming College, and that’s what it gave me., business training and confidence. We met Chef John from the Loyalist Culinary program at the Cheese Festival and talked about giving his students a farm tour. It would be in the Fall, but we said that was great, because we could show our root vegetables and the stored vegetable system. 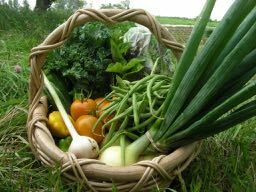 It would be awesome to show culinary students what great local food you can get late in the season. 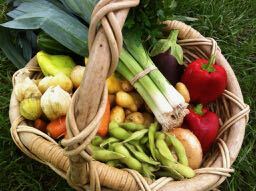 Chefs appreciate a lot of vegetables are at their peak in cold weather. A summer carrot is never as sweet as a winter carrot. First frost causes the sugar count to rise as the plant tries not to freeze. That’s what gives you the awesome sweet beautiful flavour. If you picked the same carrot a month earlier it would not be so rich. But it means we gamble every Fall. A couple of years ago we waited for a light frost of minus 1 or 2 before picking, but instead we suddenly got a minus 8. That’s a heavy frost! Two nights in a row we kept our fingers crossed and ran out at night putting as much cover on the crops as we could. The most susceptible crops were things like beets that still had greens on them. And if we had lost our Nappa cabbage, that would be a $10,000 crop gone overnight. We were lucky. The cabbage got a little burn on the outside leaves, but we husk them off anyway. We survived by the skin of our teeth. Then we had a whole month of glorious warm weather. Farming is like that. 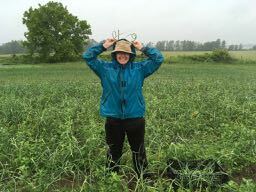 Heather has a degree in Landscape Ecology, and she works a few hours a week with the Ecological Farmers of Ontario. 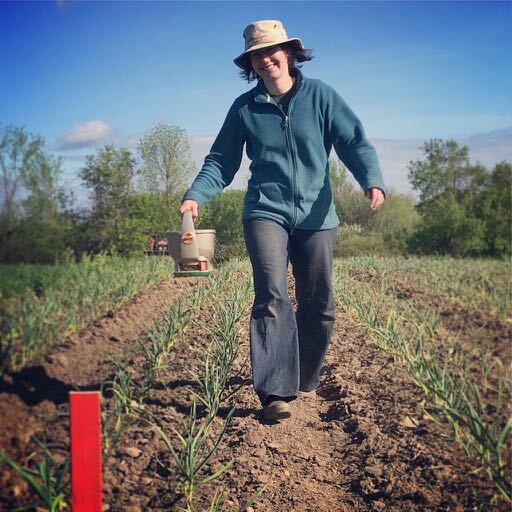 We’ve started a Farmer Led Research Program to help farmers answer questions through a culture of science. Too often, the default answers in farming are not eco-friendly. We’re trying to find ways to help farmers to farm better, environmentally, financially and efficiently. One example is a friend who is raising a small flock of chickens on pasture with the new Artisanal Chicken Program. His chickens were bred to be raised in barns, and he has heard that probiotics are helpful for pasture raised birds. He came to us with questions and a list of probiotics he wanted to try. We worked with him to develop a research protocol and he is experimenting this summer with three types of probiotics plus one control. It’s basic concepts, a control, replication, and randomization. I go up to check on his project. Our organization provided funding for the probiotics and tools he needs that he wouldn’t normally use. At the end of the year we will get the data, run the stats. He can trust his results, and we will share the results on our website, and through a publicly accessible library. We share the information we gather. We teach each other. It’s the best way to learn. I love the work. Steve was not a farm boy. He grew up in the suburbs. He studied politics at the University of Ottawa and says, “My early politics were shaped by the creation of the Green Belt and the Oak Ridges Morain – the efforts to prevent urban sprawl swallowing up all the farmland. I lived on the edge of the suburbs and looked out at farmland and I saw it being developed. I was aware of the cross section between environmentalism, development and food. I was concerned about preserving farmland, about the need continue growing our own food and also the need to grow better food. A book called The End of Food had a big impact on me. I learned about food that is grown strictly as a commodity, like tennis ball tomatoes that are bred for shipping. They don’t bruise easily. They also don’t taste of anything and have lower nutrition. 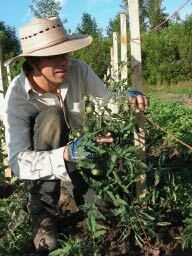 Real tomatoes are delicate, require a lot of hand care and are full of flavour and nutritional value. I wanted to see a shift back towards that. I did a Masters in Political Theory at Queens University and came out wanting to do something practical. I travelled for a year and a half. I fundraised for Greenpeace, but only for about two weeks because I sucked at it! I did door-knocking for political campaigns, which I hated. That was it for political work. My volunteer work is now my connection to politics. The act of growing food in today’s climate, especially the way we do it, is political. We are pushing change, trying to change the way people eat and the way food is produced. Working to get it back to being more diversified on a more local scale. 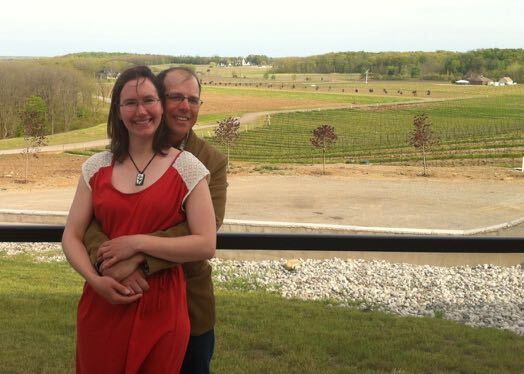 Steve and Heather met on a farm in Ottawa when she had finished her degree in Landscape Ecology. Heather tells it. “I studied the environment, I did research, I did a Masters, I was a biologist. I’d done field work for six years, summers doing research in the field, winters writing it up, doing classes and more research. But coming out of my Masters I felt the need to do SOMETHING. I sometimes say I did a Masters of Disenchantment of Science. I love science, but discovered I didn’t want to be a researcher. I didn’t want to move around all the time, change my life, leave the community I was working in every couple of years because research funding says you have to move. I love science, but it was not going to be my future. I was a CSA member, getting my box of food, and I volunteered on that farm in my last semester. I’d jump on my bike Sunday morning, ride two hours to the farm, help in the field for three or four hours, then heave my bike onto the bus to go home. It helped me through my final year. Coming out of my degree I wanted a break, and the farm had a job for $100 a week, not enough for anything, but when you want a break it feels like a paid holiday. That’s where I met Steve – and Steve was ready to start a farm. I figured I’d have to leave the city to find a job anyway. So I thought I might as well come down to Prince Edward County. I’m from Montreal but we always had a cottage and I was always playing over at the dairy farm. I had a feel for rural living, so moving to the country sounded good to me. 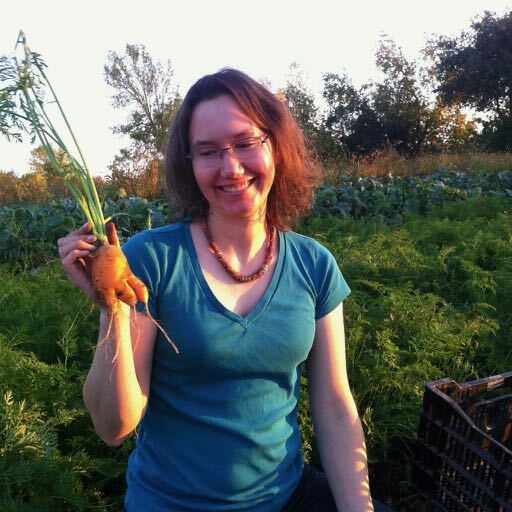 I came to The County and worked for several people, including Vicki’s Veggies was one of them. Tim and Vicki have been a great introduction to a lot of people coming here. I found the best work I was getting was farm work and I liked it, so I decided to join Steve at home. I know Steve’s dad had been looking in Niagara, but I wouldn’t have wanted to go there. I had ties to Montreal. We did look further north, but it really is different in The County. There are so many things about the community that made it feel like it could be home. We appreciate good food and wine and things to do. Tourism supports a cultural scene that’s rare in rural areas. Other places we looked at were not very adventurous, actually some felt like ghost towns. Prince Edward County felt more like home. 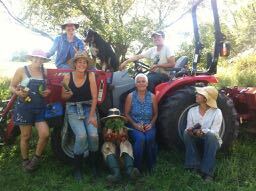 And there was this group of welcoming farmers who were ecologically minded and said Yeah, we do that kind of thing, too! Come and work with us! Steve had talked up The County so much I thought he’d been here a lot. But when we rented a car and were driving down Highway 49 to meet with a realtor, he confessed it was his first time in The County. I was shocked! He had really sold me on it. And he was right. When we drop into Three Dog Winery, we meet neighbours and all sorts of people. In the city you run into people whenever you step out of your house, but here the houses are far apart, so you have to find places to get together. The County offers a lot of small business support. You can reach out and find others like you. Like at the Creative Minds get together, it doesn’t matter if you’re a farmer or an artist or whatever, if you’re a small business you’re dealing with a lot of the same issues. We got help from Career Edge to find employees, from PELA with some funding. And our accountant actually gets us! We work with other farms, ordering things together to cut costs. There is a great network of small producers, and it extends to surrounding areas, Kingston and Hastings, too. 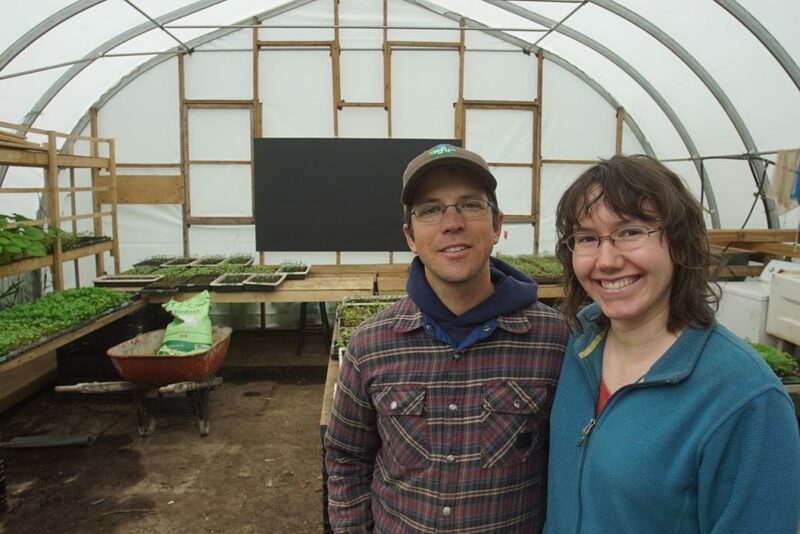 Tim Noxon started ordering potting soil – a big issue for small farms, getting really good rich potting soil for vegetables – but the supplier who made a great custom mix had a minimum order of 12 skids. So a bunch of us joined in, including Sass from Floralora, and by teaming up we got this 12 skid order of perfect custom potting mix. Steve got a great thing going, too. He brings in supplies for our paper pot transplanter, a very cool gadget for small farms. it’s like a little sled with a handle that you pull. You plant all your seedlings into what is basically origami – it looks like an accordian. You plant one seed in each pot, and when the pot gets wet part of the glue dissolves. You pull on one end and it becomes a long paper chain of little hexagonal pots. You put the end in the ground with a tent peg and pull and they all get tucked into a little slot in the ground, all planted and covered up! It’s amazing and a million times faster than, say, planting onions bare root by hand. Steve now orders paper pot supplies directly from Japan which drastically saves on ordering through the U.S. There are a number of farmers in this area and across Ontario who are interested. Every year more farmers join us and this year we had four skids of supplies delivered. By cooperating, we save on shipping costs and crazy markups. We pay about half the usual price of these supplies. It’s the kind of thing that works for us all. We’re always learning and always sharing. For start-ups or businesses looking to expand or re-locate to The County, you can fill out this Business Inquiry Questionnaire, and the Community Development Department will respond in 48 hours.